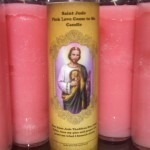 Recently I had an inquiry regarding the white Saint Jude Candle and it reminded me that not all know about the different colors of the St. Jude/San Judas Tadeo novena candle. Here is a detailed explanation of the three candles and the meaning and work for each of the green, white and pink candles for St. Jude. Saint Jude Thaddeus, also known as San Judas Tadeo in Latin countries, is considered to be the Patron Saint of “Lost Causes” – the Saint to go to when all hope is lost and there seems like nothing can change the inevitable that is coming. St. Jude is a popular Saint and one who the legend says like to be recognized with a public announcement when prayers are answered, usually has devotees who give nine days to a novena to him. Many adherents have different opinions regarding how many times each day, as some pray nine time for nine consecutive days, but the traditional length of time for a novena to Saint Jude is nine days. The quantity of prayers contained within each of those nine days is subject to one’s own discretion. Legend also says that the Saint’s desire to be recognized for good works stems from the confusion many have over Saint Jude and Judas Iscariot, who betrayed Jesus. They are not the same person. Saint Jude is one of the original Apostles who follow Jesus Christ and is depicted with a flame over his head, indicating he was in attendance at Pentecost. Saint Jude’s Feast Day is October 28th, according to the Catholic calendar. 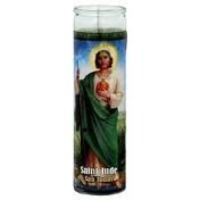 To petition St. Jude with a white glass 7-day novena candle would be for situations that require a decision such as a court case, a lease or agreement or any other matter that does not involve personal relationships or money. It is best to clean the candle with lemon juice or Florida water and anoint with St Jude Oil before lighting. Writing a small petition for the purpose of the candle and placing it under the candle helps boost the power of the petition, however, if keeping your intention quiet from prying family members, holding the petition near your heart is a good alternative. Remember to purchase enough candles to make the novena for nine days since today’s candle do not last as long as before and you may need up to three to make the nine day novena. Remember to publish the prayers granted by San Judas in a newspaper or even a mass e-mail out to friends and family. Let them know the good works of St. Jude. 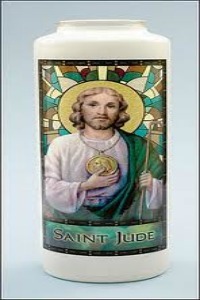 A white Saint Jude candle can be used in place of a colored wax St. Jude candle is not available. This is because white has all the colors of the rainbow in it, as a clear prism will refract the rainbow and in olden times there were no tinted wax candles, only creamy white ones made of tallow. 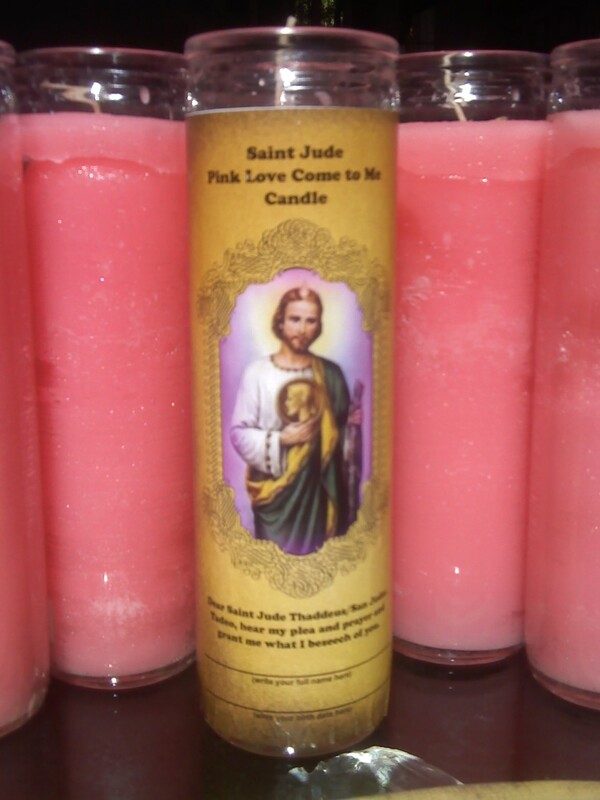 To petition Saint Jude on matters of love and personal relationships, it is best to use a pink Saint Jude candle.The color pink resonates the energy of two colors red and white. 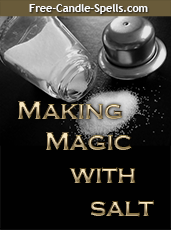 In candle spells, red is the traditional color for swiftness and passion. White candles are used when clarity and blessings are needed. The combination of the energy and passion of red and the clarity and blessings of white blend into pink, a color that evokes romance and affection. 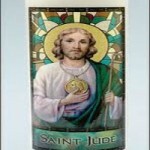 When financial gain and money is desperately needed in the home to cover immediate family needs, using a green Saint Jude candle anointed with Money Drawing Oil is the appropriate candle to use to petition Saint Jude. Follow the instructions under the category of Money Drawing Candle Spells located at the right of this website and substitute green St. Jude/San Judas candles for green candles in your candle spell.